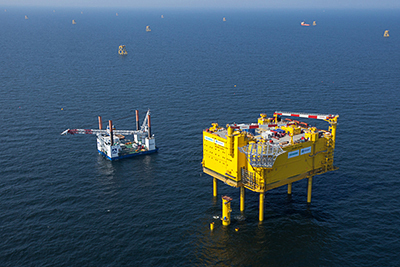 Siemens hands over HelWin1, the second North Sea grid connection to TenneT: The German-Dutch transmission system operator has now also put this grid connection into commercial operation. Siemens has now handed over HelWin1, the second North Sea grid connection in quick succession, to its client TenneT. The German-Dutch transmission system operator has now also put this grid connection into commercial operation. The offshore platform of the HelWin1 grid connection is located around 85 kilometers off the German coast – northwest of the island of Helgoland, after which the project was named. Up to 576 megawatts (MW) of clean electricity can now be transmitted with this grid connection – enough to supply more than 700,000 German households. The Nordsee Ost and Meerwind Süd/Ost wind farms are linked to HelWin1. At present, wind turbines with a total capacity of around 260 MW are linked to the grid connection, with new turbines being connected almost on a daily basis. The Meerwind Süd/Ost wind farm is made up of 80 Siemens 3.6 megawatt wind turbines. “This year we have completed the world’s first two large-category offshore grid connections equipped with efficient direct-current technology. We also intend to put the next two projects into commercial operation as planned within a few months,” stated Jan Mrosik, CEO of the Siemens Energy Management Division. “With the completion of HelWin1, TenneT now provides around 2,000 MW of transmission capacity in the German North Sea,” explained Lex Hartman, Member of the Board at TenneT TSO GmbH. TenneT is therefore in good time fulfilling nearly one third of the expansion targets of the German Federal Government of 6,500 MW by 2020. Transmission system operator TenneT contracted the consortium consisting of Siemens and the Italian cable specialist Prysmian for the HelWin1 offshore grid connection in summer 2010. Siemens is now implementing five North Sea grid connection projects for TenneT: HelWin1 (576 MW) and HelWin2 (690 MW) off of Helgoland, BorWin2 (800 MW) and BorWin3 (900 MW) off of Borkum and SylWin1 (864 MW) off of Sylt. Two of these, BorWin2 and HelWin1, have already taken up normal operation. The next two grid connections, Sylwin1 and HelWin2, are scheduled to take up commercial operation in the first half of 2015 as well. Siemens received its latest order for a grid connection in the North Sea, BorWin3, in a consortium with Petrofac in the spring of 2014. Commissioning of this fifth grid connection from Siemens is scheduled for 2019. The grid connections implemented by Siemens for TenneT will have a total transmission capacity of theoretically more than 3.8 gigawatts (GW), providing electricity from offshore wind power to supply around five million households. Thanks to the Siemens high-voltage direct-current (HVDC) technology, transmission losses for each grid connection, including cable losses, are less than four percent. This Siemens HVDC technology is installed on the offshore platforms and in the land-based converter stations. The wind-based electricity is transmitted as alternating current to the converter platform, transformed into direct current and fed to the mainland via a subsea cable. The land-based station converts the direct current back into alternating current and feeds the electricity into the extra-high voltage grid. HVDC is the only efficient transmission solution for cable lengths of more than 80 kilometers. Siemens hands over HelWin1, the second North Sea grid connection to TenneT: The German-Dutch transmission system operator has now also put this grid connection into commercial operation. The offshore platform of the HelWin1 grid connection is located around 85 kilometers off the German coast – northwest of the island of Helgoland, after which the project was named. Up to 576 megawatts (MW) of “green electricity” can now be transmitted with this grid connection - enough to supply more than 700,000 German households.